Some days I feel like I am part of two worlds. I have my day job, which helps pay bills, buy art supplies, and important things (like groceries). I also have my art work and my art jobs. Usually those are separated throughout the week, depending on what day, or part of the day it is. Today I felt like I was ping-ponging back and forth between both worlds. Starting first with a shift at my day job, then to drop off artwork, pick up my dad’s artwork, back to a second shift at my day job, and then off to the St. Paul Art Crawl. It was a long day, but I have enjoyed so much of it. The St. Paul Art Crawl is pretty awesome! We did not get to much of it, because I didn’t get off of work until late, and because I have a lot more artwork I need to be working on the rest of the weekend. But the little sliver we did see was pretty great! I definitely want to go back and hang out in Lowertown St. Paul a bit more. We went specifically to find Leatherworks MN. I had seen a bit of their work at Northerngrade this past winter, and wanted a better look. They have a lot of great things! It was so nice to stop and chat with them, and happily I have a new wallet and a new little clutch on the way! 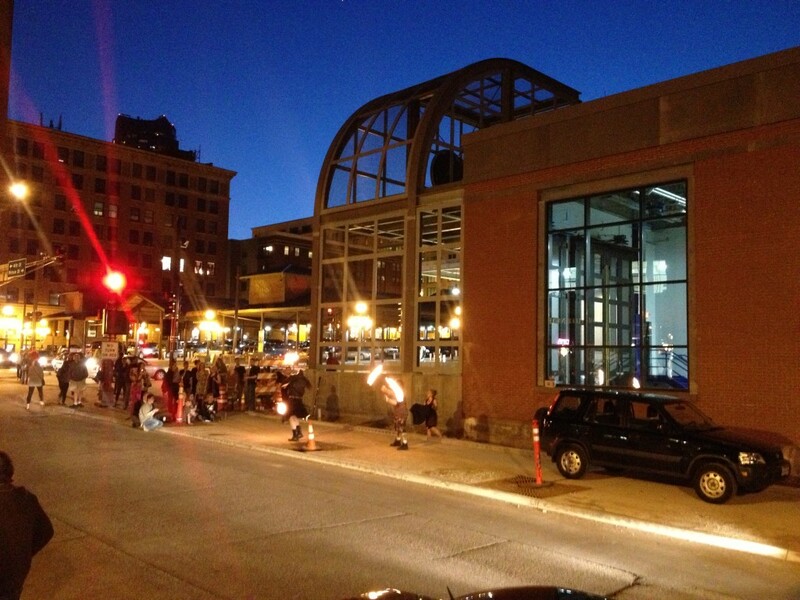 We left there to see fire dancers dancing on the street, and grab a bit of dinner at Tanpopo Noodle Shop. I could easily spend all weekend there. Of course, this is my weekend off from my day job, and it will be another albeit shorter installment of ‘make all the things’ weekend. I have a lot of work to be done, and we’ll see how far I get! As usual, here are the poems I have written over the past few days. Have a wonderful weekend! they don’t need to be tipped, but not paying on time will lead to shredded papers. Your morning espresso may soon be brought by a small tinny metal robot. His name is Nicolas. He specializes in Lattes. He accepts tips in the form of tiny bottles of small engine oil. Your mail will be delivered by teleportation. Beware, glitches in the system can scramble your package contents rendering the item useless. Call the main lifestyle troubleshooting hotline if you require assistance with any of the above. she must have done this a million times. surrounding her in a web of light. and dance with wings of fire.